For the purpose of financially strengthening the needy, the government of Chhattisgarh has been running many welfare schemes. The main purpose of these schemes is to make the rural and the poor people of Chhattisgarh financially stronger, who in turn shall make other people stronger. Those who benefit from these schemes, become self-reliant and open the doors for others too, to provide for the bread and butter of their families as well. This should gradually increase the income of all the people of Chhattisgarh making the state reach the peak of progress. One of the schemes that financially strengthen the poor is Kadaknath Kukkut Palan. With Kadaknath variety of chickens, the farmers are now looking forward to becoming entrepreneurs. Radhey Shyam, living in Dhimar, has a similar story. Radhey Shyam and his wife Renuka were afflicted by various financial problems. Their economic situation was not good. Somehow, they were managing to make both ends meet. Sometimes they used to get work and most of the times, they had to wait for many days to get work. Whenever they used to get the work, they would earn around 200 to 250 rupees per day, otherwise it used to get highly impossible for them to even arrange for food for themselves. Radheshyam’s days started to change with the Kadaknath Kukkut Palan scheme. He installed the Kadkanath's hatchery unit with the help of the government's plan. In this way, he started practicing the breeding of Kadakanath. 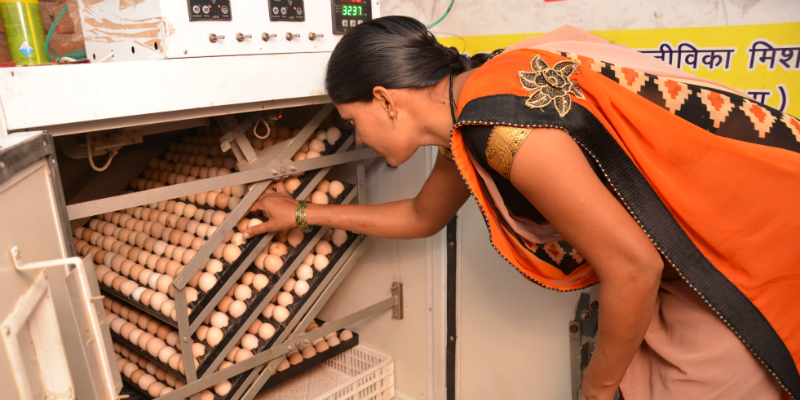 The advantage of hatchery was that Kadaknath's eggs were sown in hot spots and they soon developed into chicks. These chickens are sold at great prices in the market. Their price might be less in the local market, but in Rajnandgaon headquarters and Raipur, their price reached sky-rocketing heights, starting from five hundred to one thousand rupees. Those involved in the upbringing of Kadaknath, buy their chicks from those big markets only. They also have a massive demand. It is immensely beneficial to Radheyshyam. Radheyshyam explains that he has benefited a great deal from Kadaknath breeding. The financial condition of his family has improved a lot. Due to which, he has been able to send his children to good schools. He say that people come from far away to buy Kadkanath from them. Radheshyam not only sells chickens, but people from far away also go there to buy Kadaknath's poultry. Radheyshyam is currently running a poultry farm from his own home, and his income has now become in lakhs, and not just mere thousands. Radheyshyam has also made plans for the future. They are preparing to open new poultry centre and their goal is to make an annual income of 6 Lakh rupees from poultry. He is not the only village farmer who has benefited from the Kadaknath Palan Yojana. There are many other farmers in Chhattisgarh, who have made livelihood easier while going ahead in this direction. The effect of the government's scheme is that Kadaknath is giving economic support to the needy in the entire state. Scientifically, there is high protein in Kadaknath and it is also delicious in taste too. Another feature is that it has less fat in it. In other species, the amount of fat is up to 25%, whereas in Kadaknath it is only up to 1.03. It also has less cholesterol in it. That is why they also have the highest demand. That's why its breeding is being encouraged. Subsidies are also being given to the needy to develop their hatchery.